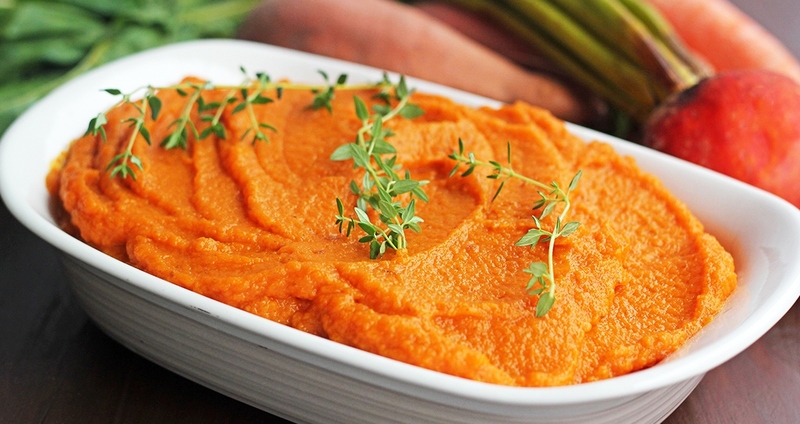 This Root Vegetable Mash is a hearty and nutritious side dish for any weeknight meal or holiday dinner. Root vegetables are a wonderful source of vitamins, minerals and fiber, plus their natural sweetness can help to satisfy sugar cravings. This simple recipe is delicious as is and can also be easily adapted to suit your tastes. Try adding a bit of roasted garlic and olive oil for a savory mash, or chopped pecans and a drizzle of maple syrup for a sweeter version! Add beets, carrots and sweet potatoes to a medium pot. Add enough water to cover the vegetables. Bring water to a boil, then lower to a simmer. Cook for 20–25 minutes, or until vegetables are tender and can easily be pierced with a fork. Using a slotted spoon, transfer vegetables to a large bowl or food processor. Mash by hand or process vegetables, adding a bit of the cooking liquid if needed, until vegetables reach the desired consistency.